If you knew love would hurt you, would you fall? If you knew love would leave you, would you let it go? If you knew love could never be, would you try? From bestselling author Randi Cooley Wilson comes a love story about heartbreak, second chances, and letting go. The ifs that linger between the pages of this novel will break your heart and stay with you long after the final chapter. Lincoln Daniels never wanted to find love. But when he met straight-laced Emerson, he fell. Hard. The only thing they seemed to have in common was an undeniable mutual attraction, but from the moment he laid eyes on her, there was something about her that called to him. Until he lost her. 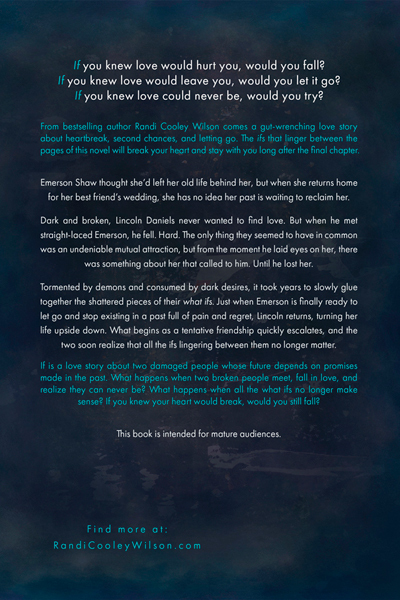 Just when Emerson is finally ready to let go and stop existing in a past full of pain and regret, Lincoln returns, turning her life upside down. What begins as a tentative friendship quickly escalates, and the two soon realize that all the ifs lingering between them no longer matter. I'm so lost for words! This book literally had me captivated, swooning, broke me, healed me, and left me a crumbling mess! So many emotions so empowering. This is my first book by this author and sure as heck won't be my last! I just devoured this book! This kind of love story is my favorite. I loved Emerson and Lincoln’s story so much and it was worth the wait. It had just the right amount of angst. The cover truly matches the beauty inside. I definitely recommend this one! This book just sucked me right in from the beginning and I just couldn’t put it down. 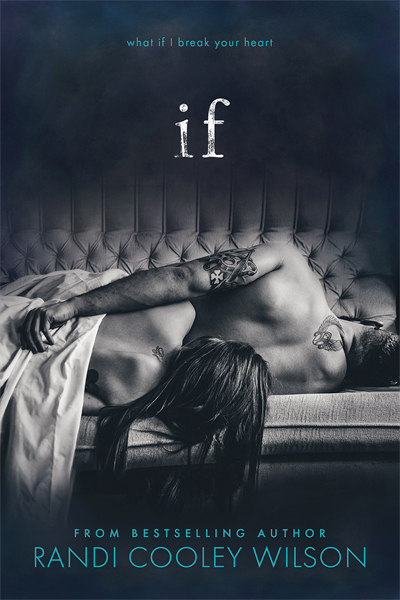 NA adult novels are always hit or miss for me, but Randi Cooley Wilson does a phenomenal job with If. If is an enjoyable, angsty read that moves at a great pace. This is definitely one of those rare books that I will re-read. This story had me in the first chapter. My heart was all twisted in the best way. This story had heart, all of the emotions, steam, and SO much passion. It is Randi Cooley Wilson’s best work yet. This ripped my heart out several times, while also mending it just a little bit. This book is raw and very emotional. I couldn’t put it down when I started it. The chemistry was off the charts, and you could feel it coming off of the pages.